One of my cats brought this guy into the house this morning. I searched on eyespot caterpillars in Texas, but didn’t find one like it. Or maybe even an ID? I wrote Tom back that this appears to be a tersa sphinx moth caterpillar (Xylophanes tersa). So Tom was right, as the sphinx moths are a subset of the Spingidae family, which includes hawk moths amd sphinx moths. Among these are the hummingbird moths, which are hawk moths that, like hummingbirds and certain bats, have evolved the ability to hover in a very precise position while inserting their proboscis deep into a flower’s nectary to extract its nectar. The sphinx moths are not known to be endowed with this capacity, but the sleek lines of the mature moths indicate that they are superb fliers. Here, of course, we see only the caterpillar, which appears quite clumsy and slow, as caterpillars–in general–are wont to be. The genus Xylophanes (Xyl-o, from the Greek prefix ξυλον, “cut wood/timber” + phanes, the Greek suffix φανερος, “visible, evident” = an herb feeder with huge eye spots) contains some 87 known species. 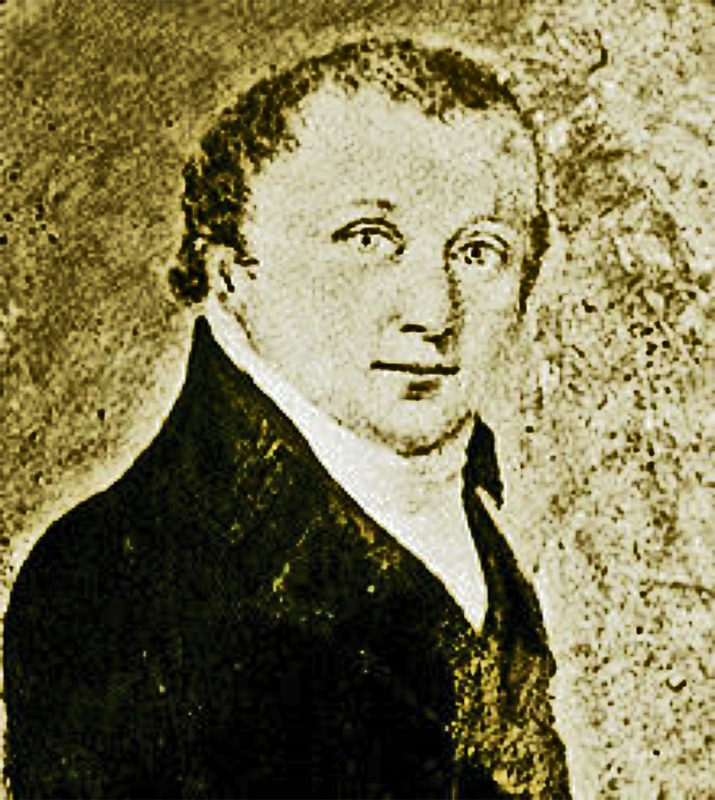 The generic name was assigned in 1819 by Jacob Hübner (June 20, 1761-September 13, 1826). Hübner began work as a designer and engraver in the cotton industry, working in the Ukraine at a cotton factory for three years. As a hobby, while in the Ukraine, he collected and studied butterflies and moths. Later he returned to his home in Augsberg where he turned his hobby into a serious scientific endeavor. Because he was adept at illustrating butterflies and moths on paper, and in describing them in words, his works soon rose to the top of the existing literature on these animals. Hübner is known today as one of the master specialists in early European Lepidoptera. Tersa sphinx moths are scattered from the U.S. through Central America, and deep into South America. They prefer tropical climes to more temperate ones, but sometimes range into just about every region on the continent. This most likely is a reference to the unusually elegant lines of the mature moth, whose sleek body and wings appear perfectly designed. 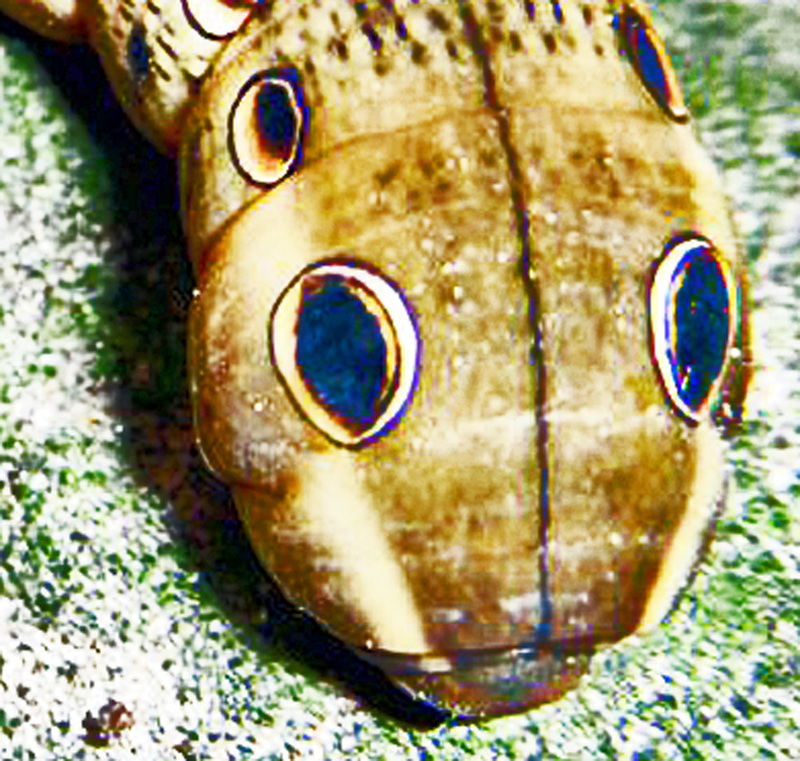 The large “eyes” (eye spots) on the anterior of the caterpillar are thought to dissuade potential predators. When threatened, the caterpillar tucks its head downward, in a defensive maneuver that prevents the predator from making a direct strike on that most vulnerable portion of its body. It then pulls its head inward, into the anterior portion of the body, giving it even more protection. In the process, the anterior body balloons laterally, causing the eye spots to dramatically enlarge. This startling effect is often sufficient to frighten even the most determined predators into forgoing a good meal in favor of prey that is less intimidating. Most Sphingidae caterpillars are known generally as hornworms, for obvious reasons. 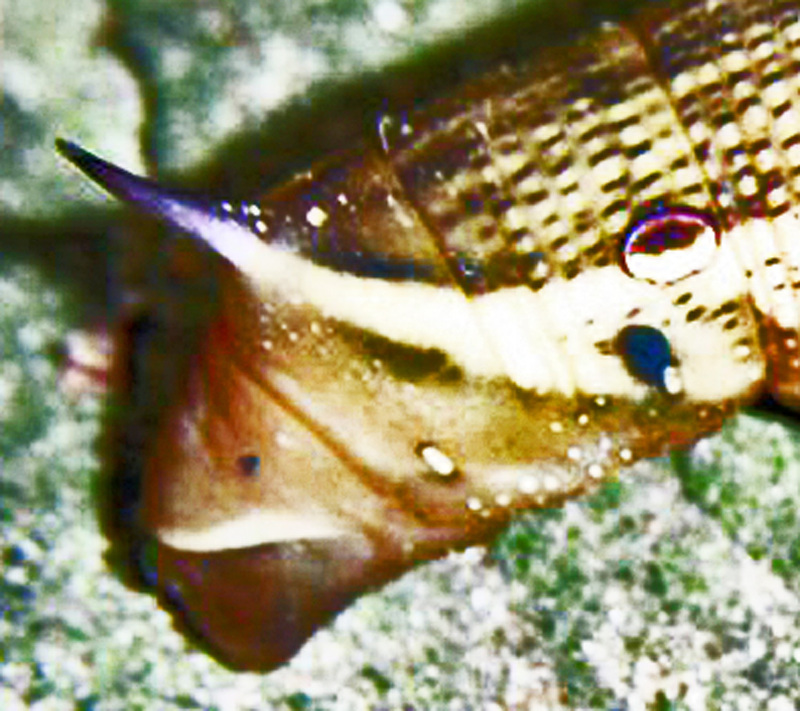 The posterior of this caterpillar’s body is adorned with a single horn of medium length.In other species this horn is longer, in some cases markedly so. Though it is not sharp or hardened, its appearance is of a structure capable of inflicting serious injury. Thus it, too, figures into this harmless caterpillar’s faculty for survival in a hostile world by giving it the look of a dangerous adversary not worth messing with. I found a similar worm-like creature but with a protruding nose & orange tip in my garden in Germiston (South Africa). Who can I ask for advice to identify it? Do you have a photo? If so, send it to me at jerry.cates@entomobiotics.com and I will key it to genus and species. 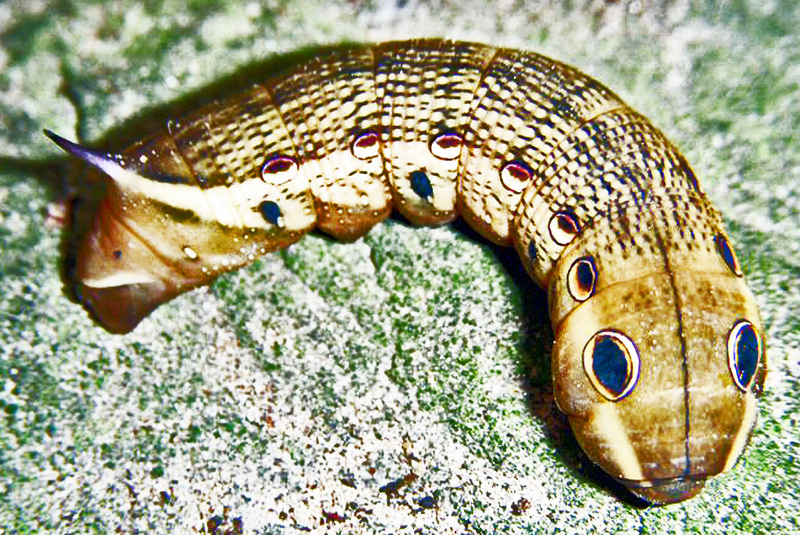 I am looking for a picture of the Africa/Madagascar originating Morgan’s Sphinx Moth larvae. Found one of these guys today chewing up my red penta. He’s huge and ravenous. How long till he pupates?